Track down a traveling merchant to take part in end-of-year festivities. Speak to Agrane Peryval at his camp north of Windward Ruins. This short quest will be added to your journal upon installing the Saturalia Holiday Pack Creation. 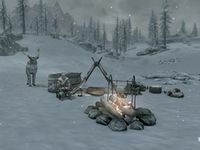 You will be directed to locate a merchant who has set up shop near Dawnstar in advance of Saturalia, a festival which takes place on the 25th of Evening Star. Note that the in-game time of year is irrelevant for the purposes of this quest. The merchant's camp can be found just outside Dawnstar, north of the Windward Ruins. It is located close to a World Interaction spawn point which may prove problematic. The merchant is Agrane Peryval, who can be found at the camp along with a tame reindeer. Simply speak to Agrane to finish the quest; you are under no obligation to buy anything from him. If you do choose to make a purchase, his stock includes several unique items: three sets of festive clothing (Saturalia Boots, Saturalia Clothes, Saturalia Gloves) and a bill of sale for the nearby reindeer. Once purchased, the reindeer can be used as a mount, and will return to this camp if you switch to another mount. Finishes quest Saturalia is coming soon, and there are rumors of a new merchant up near Dawnstar who sells very rare and unique wares just for the holiday. I should go look for him. This page was last modified on 8 December 2018, at 20:27.